This "memory" came through my Facebook feed today, and gave me my first belly-laugh of the morning. 2 years! That's the amount of time I originally estimated working my way through Hegel's entire Phenomenology might take me. As of today, I'm now four years into the series. I've produced 236 video commentaries, generally between 25-35 minutes in length - so that's about 116 hours of video. And. . . since I'm at paragraph 567, I'm about 70% finished. So, at this point - having spent twice the original two years that I thought the project would require - I can now estimate that, after another two years, I should have it finished up. And that, my readers and viewers, is simply hilarious to me! I'm not all that good at estimating and budgeting time, but to be off by that amount. . . well, it makes you think, doesn't it. I was actually very surprised to see that I had in fact lowballed the time required, and somehow come up with that figure of two years - if I didn't see it there in my Facebook "memories", and you had told me that I had originally gave that number, I wouldn't have believed you! But there it is. I don't begrudge the time, thought, and work that this project requires. Why? Because I've got the metrics to prove to myself that these Half Hour Hegel videos are having an impact and being used by thousands of people worldwide. At this point, the videos have had over 360,000 views. They have been watched for 3.7 million minutes. (These numbers are a bit low, since I'm using the YouTube analytics for just the first 200 in the series). Let's say that 2/3 of those views were just clicks and bounces - the average view duration for these videos is about 10 minutes. That would still be 120,000 full views of these commentary videos. There are two other really interesting - and I think highly relevant - measures. One of them is the number of playlists these videos have been placed into, over 8,000. I'm willing to bet that the majority of these are actually "watch later" playlists. Let's say 90% of them are. That woulds still be 800 real playlists these videos have found their way into. The other one is the numbers of likes and dislikes. YouTube is a tough place when it comes to audience. My Half Hour Hegel videos have 51 dislikes. They have over 8,000 likes. So clearly, while they definitely are a niche product, the videos from this project have drawn an audience. They are having an impact - the comments that I get, read, and respond to also bear that out - and so at this 4-years in point, I can definitely reaffirm my commitment to seeing the entire project through. I will say one last thing in this retrospective piece, and that is about my Patreon supporters. These videos require a lot of work in research, planning, shooting, and editing - about 4-5 hours on average for every 30 minute video - and there is no way I could afford to dedicate that time and energy if I didn't have some financial support. It's not an academic institution, a rich patron, a government agency, or even a grant - it's instead devoted individuals pooling their pledges together to support my work - people who put their money not just where their mouths are, but where their minds are. So, I'd like to say thanks to all of my Patreon supporters! And if you're someone who benefits from the videos, but isn't a supporter, you probably should say thanks to those who do effectively underwrite the series as well! i will finish the spirit section tomorrow and i am also starting the force and understanding tomorrow. 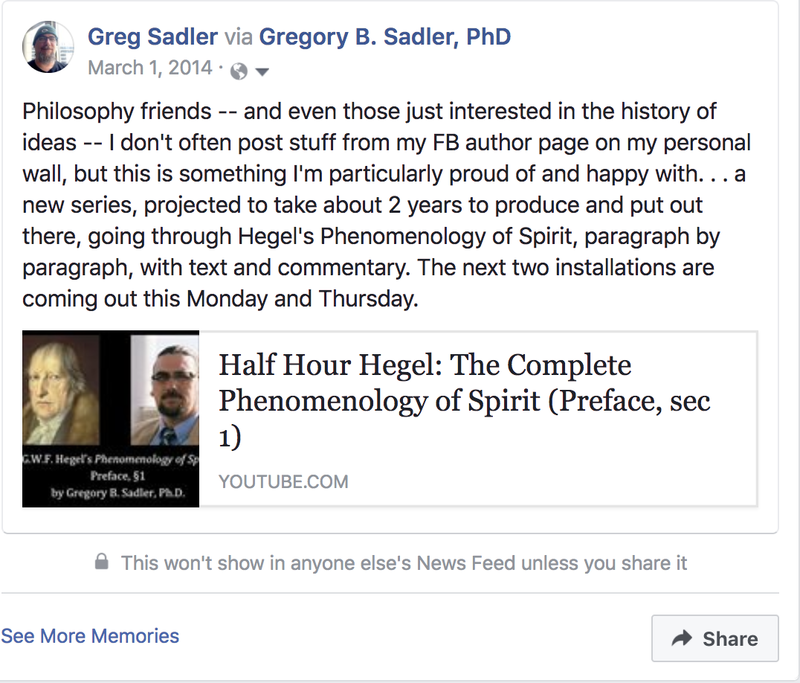 i know, i would have never tried to read hegel again without the half hour hegel project. i thank you so much for your misunderstanding of the task.